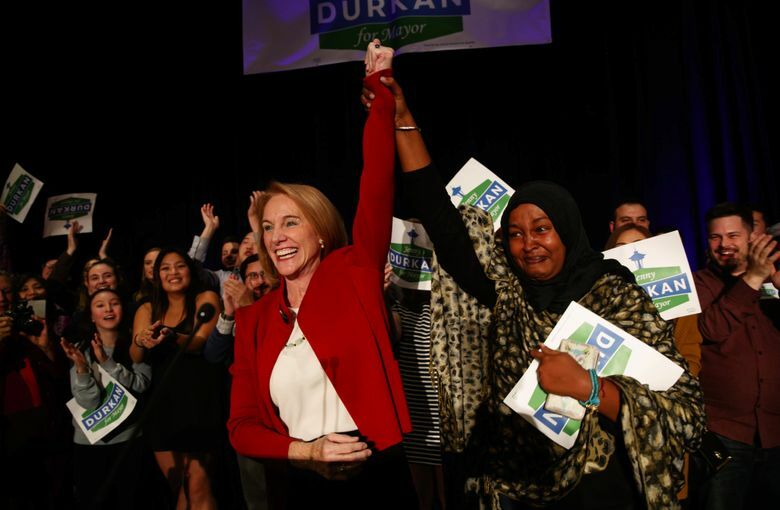 Women and people of color will hold majorities on the Seattle City Council, and an openly gay woman, Jenny Durkan, will be mayor. “That’s pretty phenomenal,” Durkan said. Seattle will soon have women in the mayor’s office and six of nine City Council seats, thanks to convincing wins posted Tuesday night by first-time candidates Jenny Durkan and Teresa Mosqueda and by incumbent M. Lorena González. Moreover, the council will have five elected members who are people of color — a majority, likely for the first time in Seattle history, according to a council spokeswoman. Durkan defeated Cary Moonin the city’s mayoral race, while Mosqueda beat Jon Grant and González routed Pat Murakamiin their respective races for citywide seats on the council. Those results came on a night that saw women, people of color and gay and transgender people score victories in elections big and small around the country. Durkan was the country’s first openly gay U.S. attorney and will be Seattle’s first woman elected mayor since the 1920s, while Mosqueda and González are Latina. Karen Besserman, executive director of Emerge Washington, described the results in Seattle and elsewhere as a repudiation of Republican President Donald Trump and his policies that Democrats say are harmful to women and minorities. “If anything good has come out of the election of that orange menace, it’s that women have gotten invigorated and energized,” said Besserman, whose organization encourages and trains women to run for office as Democrats. There was never any doubt that Seattle would elect self-described progressives, as Moon and Grant sought to run to the left of Durkan and Mosqueda. But the city’s political bent is more meaningful because Trump is in charge, Besserman said. Rather than assume office on Jan. 1, as would normally be the case, Durkan will take over from Mayor Tim Burgess and Mosqueda will succeed Councilmember Kirsten Harris-Talley on Nov. 28, when the election results are certified. The council appointed Burgess temporary mayor in September after Ed Murray resigned amid sexual-abuse allegations and Harris-Talley temporary council member in October to replace Burgess. The early handover means Durkan will have only three weeks to prepare. But Marco Lowe, a Seattle University politics professor who worked in Greg Nickels’ and Mike McGinn’s administrations, said she should resist the temptation to rush. “My advice would be to really slow down, as hard as that might be when you have a rush of energy and excitement after the election,” he said. Whatever Durkan already has learned about running the city, she must now digest more as she hires staff members and sets the tone for her administration, Lowe said. Some mayors organize their offices as pyramids of power, while others spread responsibility among many deputy mayors, Lowe noted. “You need a design that matches your leadership style so you can spend your time being mayor and not worrying about internecine warfare,” he said. Durkan said there will be personnel changes at City Hall. “I haven’t made any decisions yet. I was so focused on winning the race,” she said. At least one top official is already on his way out. Parks Superintendent Jesús Aguirre, a Murray appointee, has announced his resignation. Lowe said he thought the Durkan-Moon and Mosqueda-Grant races would be closer. Moon and Grant were endorsed by The Stranger, and Grant was also endorsed by The Seattle Times. But the professor said he expected Durkan and Mosqueda to win because they were exceptionally strong candidates. Durkan cited her tenure as U.S. attorney from 2009 to 2014 while projecting an air of competence, Lowe said. Moon portrayed herself as a collaborative leader, but the urbanist and waterfront activist had to spend time and energy explaining her less-conventional résumé. Moon and Grant knocked their opponents as part of the establishment, while Durkan won more support from business groups and labor unions and Mosqueda from unions. Moon pointed Tuesday night to the large corporations that spent money to help Durkan win, but Durkan said it was voters who sent a message by choosing her and Mosqueda. “They’re really tired of the dysfunction and division of Washington, D.C. They want to see progress,” she said.